Samsung's extensive range of glossy black products continues to grow, from HDTVs to printers and even wireless hubs. Thankfully, its laptops haven't been forgotten and for just £600 you can buy a Vista machine that competes in the market dominated by like-for-like notebooks that cost up to £200 more. 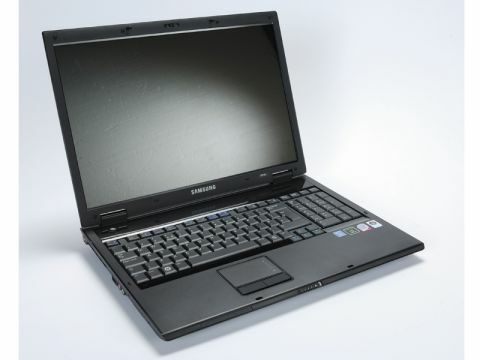 By producing a 17-inch, Core 2 Duo machine with dedicated graphics at such a low price there's a suspicion of cheap production values at Samsung. Yet we can confidently say that this is a laptop to love and live with for a long time. The R700 is the latest in the company's Aura range and has kept up well with current trends. It sports an HDMI port so that you can attach it to your HDTV - something that was only found on expensive models last year - and the four USB2 ports mean that you're never short of connection options. Conveniently, there's one USB port on the left and right side of the chassis and two at the back, so you won't have wireless mouse attachments, flash drives or cables all competing for space. Elsewhere, there's a built-in 1.3 megapixel camera for video conferencing, VoIP capability, a dual-layer DVD burner and a 7-in-1 card reader. It's packed with features and with a quality GPU from NVIDIA, games and multimedia are definitely on this machine's menu. This was confirmed by a 3DMark score of 1,641 - that's not bad from just 128MB of dedicated graphics RAM. It's no MacBook Air, but for a 17-inch laptop it's very thin and light at just over 3kg - something that few similarly sized devices can claim. Notebooks with 17-inch screens are becoming the norm over 15.4-inch, but in the main the added bulk has been hard to shift. Samsung has done well to keep the R700 so slim and lightweight that you won't tire of taking it with you. Heat dissipation is also surprisingly good. Yes, it runs a little hotter than most machines and you may find your fingers getting a little warm on the left side of the keyboard, but that's dedicated graphics for you. A laptop heatsink rest would be recommended for extensive use. In typical Samsung style the screen is gorgeous. If anything it's too bright on Vista's High Performance setting and so Samsung's own Samsung Optimized setting is a better choice. Viewing angles aren't great with significant image shift when moving away from a direct position in front of the screen, but for privacy fans this is a good thing. The lid lock is sleek and sturdy, and there was no sign of the keyboard or trackpad rubbing against the screen while closed. Prices change daily in this fiercely competitive market, so Samsung has made a clear statement with such an attractive offering for £600. Our only criticism would be the choice of processor, but 2GB RAM and a large hard drive make up for it.